but the Rome-Express is majestic. 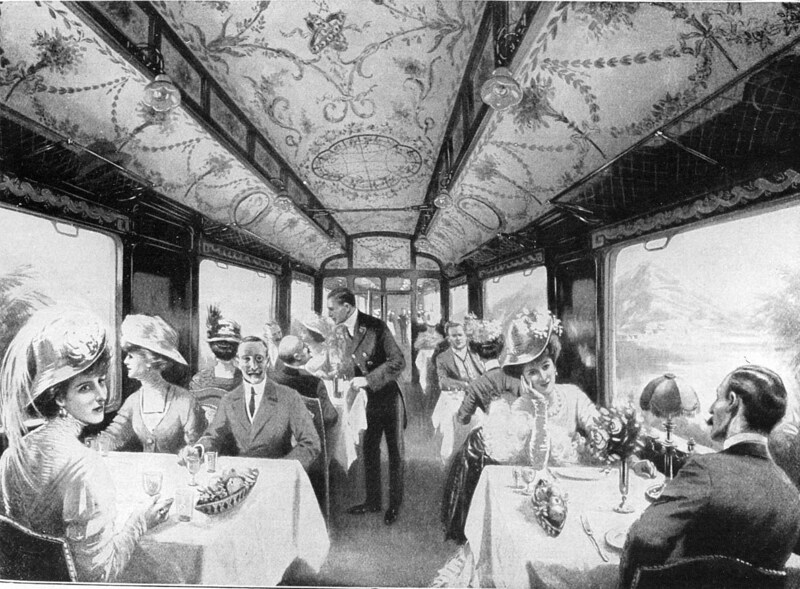 The Rome-Express was the second de-Luxe of Nagelmanckers' CIWL started in 1883 from Calais and Paris to Rome initially via the Cote d'Azur and so it became the ancestor of the Train Bleu. 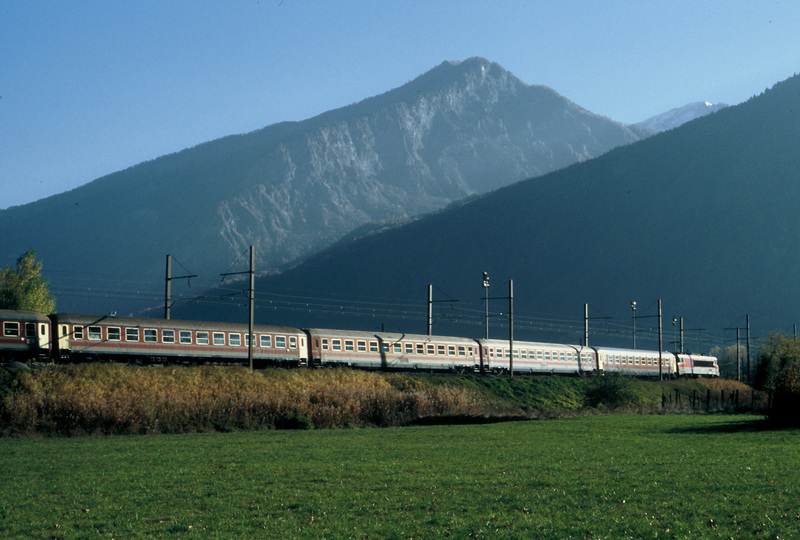 Then it took the Mont Cenis line with the Frejus - Tunnel and in Italy it ran along the beautiful Ligure coast. From 1902 a sleeper, changing to the Napoli-Palermo-Express, brought the wealthy tourists to the venerable capital of Sicily, where they might have stayed in the Grand Hotel Palme, half a century before the famous Mafia and Cosa Nostra conference took place in that noble house. 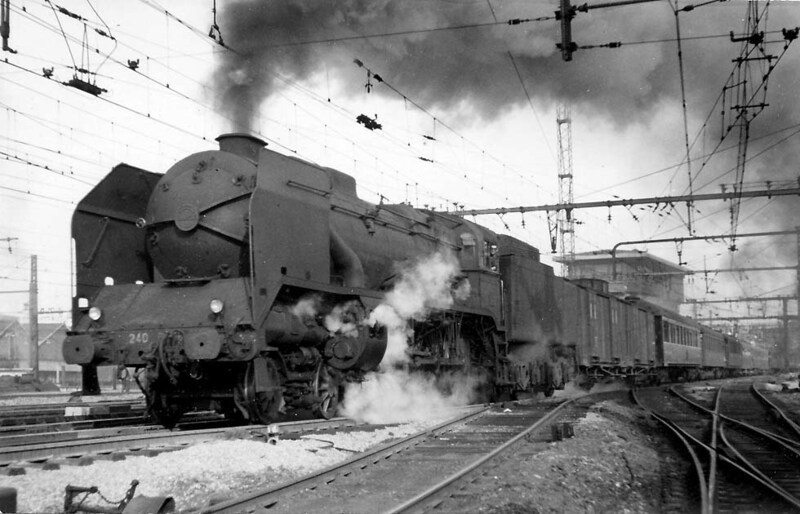 Typical locomotives of the Rome-Express were the Pacifics of PLM and in Italy the 685 class 2-6-2s. Very early the electrification started: In 1910 already the Giovi Pass north of Genova was equipped with 3.3kV three-phase ac based on the work by Hungarian pioneer Kalman Kando. The small black E550 locomotive type was called "il piccolo gigante dei Giovi". 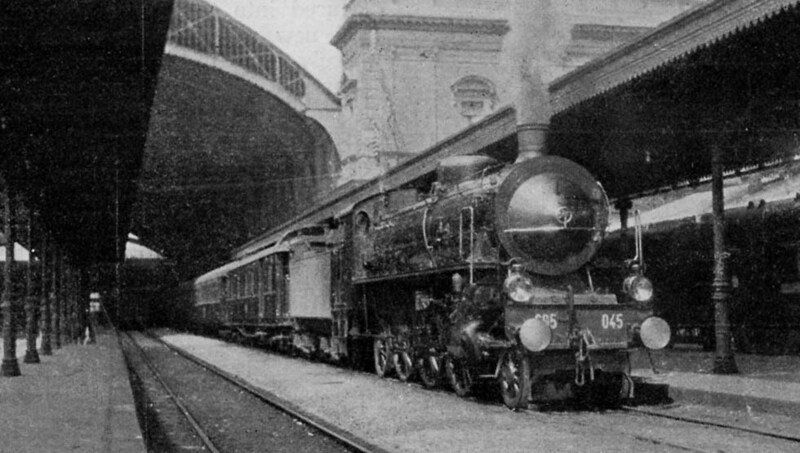 Within Naples from 1925 the E320 on a 0.75kV dc third-rail system hauled the Rome-Expess. When the Diretissima Bologna - Naples was electrified in 1935, the 3kV dc E428 became standard (and with it the khaki color scheme). In the French Alps the Chambery - Modane section was electrified in 1928 with 1.5kV dc, initially with a third-rail system for the really gigantic 2CC2 class engines. With World War II the second and last epoch of the Grands Express Europeens ended. 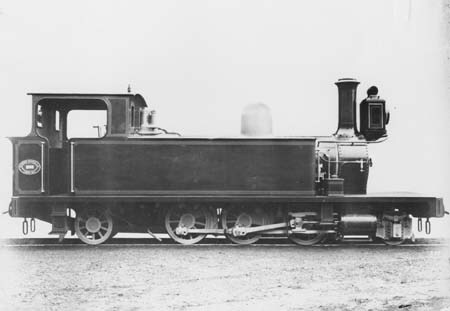 The Rome-Express re-emerged in 1952. Temporarily it was even an exclusive Wagons-Lits train, but in 1960 a section of the Simplon-Orient-Express, later Simplon-Express, took over the sleeping-cars Paris - Rome and Naples. 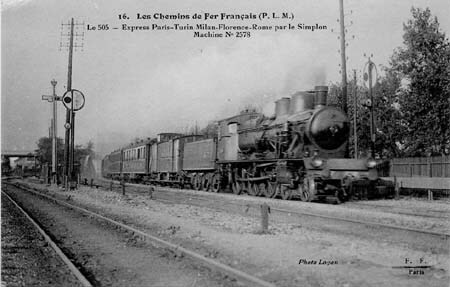 In 1969 it was replaced by the “Palatino” via Modane, from 2002 via Simplon and then banned from Paris Gare de Lyon. Its sleeping-cars Paris - Rome became operated by Italian-French Artesia. The Simplon-Express on the Venice route was replaced by the “Stendhal” Paris - Venice with a branch for Torino. The vans were 6- or 4-wheelers. Geoge Behrend mentioned in History of Trains de Luxe for the Calais-Paris-Nice-Rome-Express in 1883/84 the sleeping cars WL 145-147 and 154, for the Rome-Express from 1922 wooden S2 from series 2606-2630, from 1929 WL LX from series 3466-3555 and a van with shower from series 1277-1296. Colors: CIWL dark blue, SNCF dark green, E428 khaki. Colors : CC turquoise ("livree Maurienne"), Gril Express grey/maroon, WL dark-blue, Bc (aircond.) light-grey/dark-blue, Bc dark-blue/light-grey. Colors: E444 turquoise/pastel, Bc dark-blue/yellow/pastel fancy colors, WR turquoise/red/pastel, WL turquoise/dark-blue.